News has been received here of a terrible double tragedy which occurred Sunday, 2:00 p.m., near the little town of Eskota, 30 miles west of Abilene, on the Texas Pacific, in Fisher county. It appears that a young man of 21, named Frank Anderson, who had served a term in state prison, was charged with trying to sell a note with forged signatures, and acting deputy sheriff Brack Mitchell arrested Anderson and, in company with Will Simpson, started to Roby, the county seat, to place the accused in jail, all three riding in the same buggy. When less than a half mile from Eskota, Anderson made a break for liberty, by jumping from the buggy and starting for the brush. Mitchell threw his six-shooter on him commanding him to halt, which he did, and came back to the buggy, joking as he did so. As he reached the side of the buggy, he made a sudden and unexpected grab for Mitchell's pistol, at the same time pulling the officers' head down, and, twisting his -- the officers -- hand with his own pistol, shot him in the back of the head, making a wound which proved fatal in 8 or 10 hours. Simpson then shot Anderson through the head, killing him instantly. The team ran away, tearing up the buggy. Mr. Mitchell was brought back to his home, where he died late last night. The funeral took place in Sweetwater. Anderson's father lives in Eskota, and the boy was reared in this country. Mr. Mitchell was an old man, white-haired, some 70 or more years of age. He was engaged in several pitched battles with E.J. Davis' police when those marauders were the terror of the white people of Texas. Mitchell came to the Eskota district 8 or 10 years ago, and was deputy sheriff at Roby four years. He leaves a large family, five boys and a number of girls, most of them married, all standing high in their several communities. The father of Frank Anderson is said to be a respected, peacable citizen. All greatly regret the tragedy, so terrible and so useless. Well, the rest of the story is that -- according to family legend, which was kept hush-hush for decades -- William L. (Brack)'s son, Benjamin Franklin Mitchell (H.C.'s father and known as Ben), had some sort of dealing with Anderson's kin and meted out some "Code of the West" justice. Not sure about the reliability of that. One of William L.'s sons was legally named Brack. They are buried at the old Sweetwater cemetery, along with their wives and several other family members. 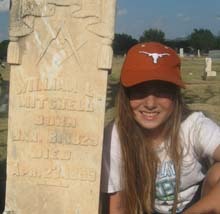 Bennie is buried at the same cemetery, but not in the Mitchell plot. Ben Mitchell is buried right next to his father.